When I found these in the cupboard I thought I must have brought them back from America but they’ve got an import label on the back so I probably got them in WholeFoods in London on one of my visits. I knew I had at least one recipe that used them but until very recently I couldn’t find it anywhere. I finally found the recipe I’d been thinking of in American Vegan Kitchen, the Fettuccine Alfredo. I’ve made this a couple of times before and for the life of me I can’t remember now what I used for the chillies on the other occasions; I must have roasted my own because I’ve certainly never used these tinned ones before. They get blended into the sauce so you don’t really know you’re eating them but they give the sauce an added something. I chose the broccoli version this time – It’s a great quick and easy pasta dish, rich and comforting. I was so hungry today I forgot to take a picture. If you make this dish, especially if you make it plain, be sure to use the Marsala rather than the white wine sub because it’s miles nicer. 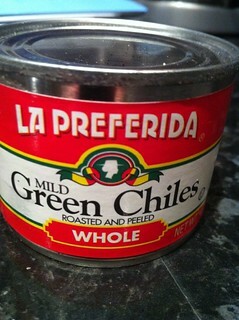 What do you use mild green chillies for? I’ve still got half the tin left. This entry was posted in American Vegan Kitchen, VeganMoFo 2012 by efcliz. Bookmark the permalink. Green chile stew is a good use. Or corn chowder with chiles. You can also make enchilada sauce. Or put them in corn bread. Or tamale pie. Or corn pudding! I have never been able to find them here, and every time I’ve tried to order them on-line they have been out of stock. It’s a conspiracy! As soon as I saw the picture I knew it was for that recipe! It’s the only time I’ve ever bought them, too. Green chillies in Fettuccine Alfredo? Tami is a genius!